Queen Mary 2 is portrayed working up speed as she departs the Solent on a very clear, brisk day early in her career. 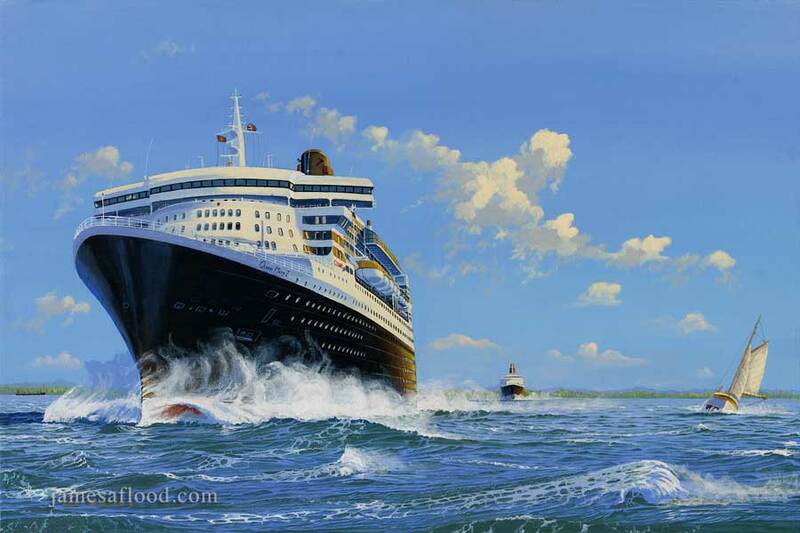 Astern of this great new Cunarder steams the beloved Queen Elizabeth 2. These two ships are the proud upholders of a tradition that dates back to the middle of the nineteenth century. It includes such proud liners as Mauretania, Aquitania, Berengaria, Carmania, and many others. Queen Mary 2 measures 1,131 feet, 3 inches long, making this colossal liner the longest in the world. Designed to carry up to 2,620 passengers with a crew of approximately 1,250, she is capable of exceeding a speed of 30 knots.